Hey there, come pull up a seat and sit with me a while. I'm sipping on a delicious Vietnamese iced coffee with coconut and ice creme, watching the world pass by. 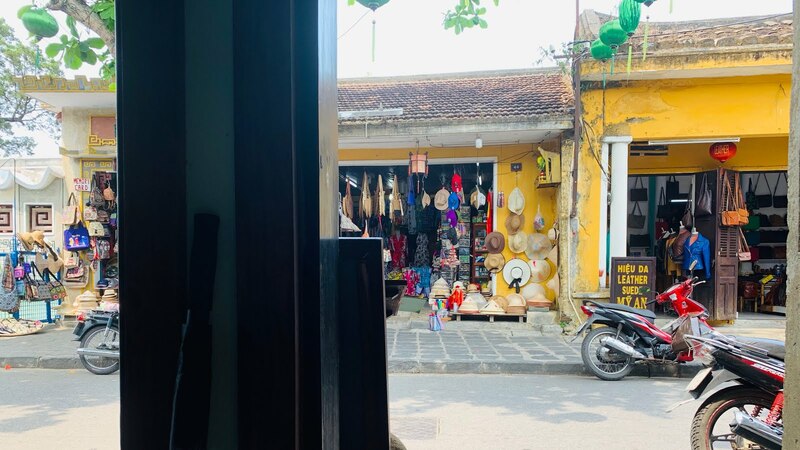 Or at least the part of the world that might wander down this particular street in Hoi An. I'm alone with my thoughts. So no talking please, just enjoy the moment. You can read my thoughts, anyway. What about Mrs P, you ask? Don't worry, she's off shopping. She could be quite some time. She's always busy doing something, Mrs P. She never stops. But I like to stop now and again. Just to enjoy the moment. And a nice coffee and a comfortable chair help me to do just that. Are you sitting comfortably? Here's a little video, just to help you settle in and live the moment with me. People generally rush about too much, you know. You can sometimes have too much fun, and if you don't stop a moment here and there, you'll never truly appreciate life. Who knows what the future holds? I know that in little more than a weeks time I'll be back at work in a train station in wet and windy England. Maybe next month ill health will strike. I could be unemployed in a year. Homeless and divorced by the time I'm fifty. Dead before I have a chance to retire. One day, the universe will likely end one way or another and everyone and everything will be gone. Nothing that ever happened will ever matter. It'll be like nothing ever happened at all, in fact. Now don't start getting depressed with all this talk of doom. I'm not moping. I'm not the anxious sort, really. Quite the opposite, I'd say. Maybe you're just missing my point. No one knows what the future holds. But right now, I'm happy. I can feel the warmth of the sun on my skin. I'm sitting in a pretty street, drinking a delicious iced coconut coffee with ice cream in it. I can hear cheerful chatter and bird song. I have a fortnight free of work. The world can be a beautiful place. And right here, right now, everything is pretty much perfect. So I like to just stop and enjoy the moment, appreciate the wonder of life, marvel at the grand stroke of luck I've been blessed with. Make the most of what I have while it lasts.